One of the topical issues with Attenuation and Infiltration systems is how to prevent silt entering the system and how to manage silt that does enter the system. Prevention is the obvious first choice. Additionally minimising pollution of the natural watercourse, in line with new legislation and guidelines such as the Water Framework Directive is becoming increasingly important. This is where the use of a Treatment Filter is necessary. 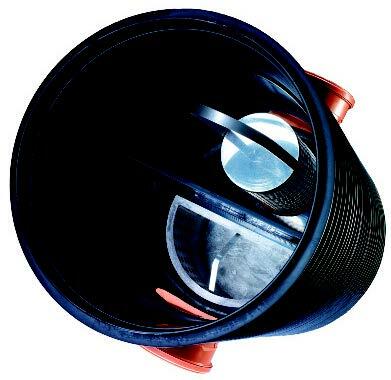 These bespoke fabricated solutions stop the ingress of silt and debris through the use of specific filters designed to suit particular requirements. As with the Silt Traps, Leaf filters are a bespoke fabrication to stop the ingress of leafs through the use of specific filters. Their use is predominantly in conjunction with GRP Attenuation Tanks. New legislation and guidelines such as the Water Framework Directive calls for stricter water quality discharged into the environment. JDP offers regulatory-compliant solutions for dealing with the issues of water quality from surface water run-off from roofs, car parks, and the most polluted roads, even in heavily trafficked areas. These products are not a substitute for use as Oil Seperators, see Surface Water Drainage section for Oil Seperators. 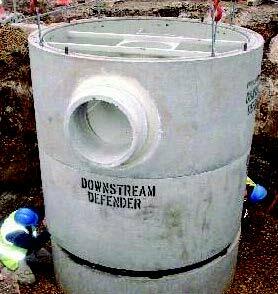 The Downstream Defender® is an ideal solution for the prevention or reduction of solids and pollutants entering water storage areas where settlement can occur, leading to a build up over time. 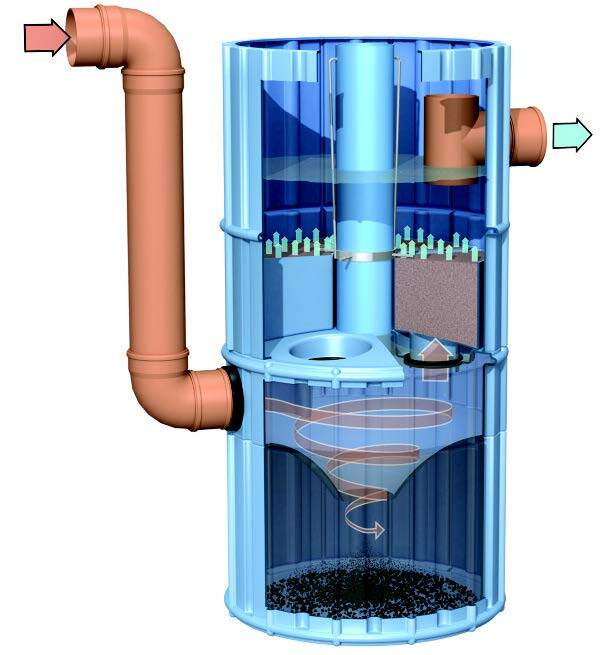 The system is a hydrodynamic separator which is incorporated into a reinforced concrete chamber. The design of the internal components directs stormwater downwards and around the periphery of the chamber inducing a rotational flow. A unique flow pattern created within the chamber encourages the solids separation, the silt sediment sinks and floatable debris floats. Both are then prevented from re-entering the main flow path. Whilst this product has an oil retention element it is not a substitute for Oil Seperators, see Surface Water Drainage section for Oil Seperators.